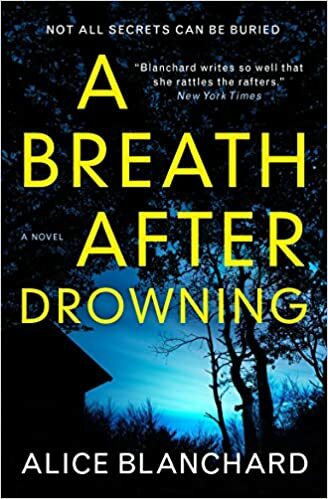 A Breath After Drowning is a well-researched and a well-plotted psychological thriller. The subject line is often dark, emotive and intense but the plot is compelling and I really enjoyed getting to know Kate. There are some great characters in this book. Dr Kate Wolfe works as a child psychologist and she deals with children and families going through extremely traumatic times in their lives. Kate herself has also had a traumatic childhood, her younger sister, Savannah was murdered sixteen years earlier and it is fast approaching her killer’s execution. But as the impending execution date draws closer, Kate is forced to revisit uncomfortable truths about her past and her sister’s murder. Is it possible that the wrong man was convicted? This is the first book I have read by the author, Alice Blanchard and after finishing A Breath After Drowning I am keen to check out her previous work. The plot takes some time to get going but I really liked getting to know Kate as her character developed, and I really engaged with her. Alice has excellent skill in writing dialouge, her scenes never felt too long and I flew through the pages. I thought that Kate’s relationship with her boyfriend was really well developed and this part of Kate’s life, for me, was one of the most enjoyable parts of the book. I liked the sense of humour that they both shared which added a lightness to the prose. In her latest novel, Alice Blanchard showcases really addictive writing. She kept me guessing as the mystery deepened, but I don’t want to say too much more about the plot as I don’t want to spoil it. If you do decide to read this book, and I hope you do, then you are in for a twisty ride. This was an excellent read, really enjoyable. Thank you to Philippa Ward at Titan Books for sending me a copy of the book to review and for inviting me to take part in the blog tour.